Based on her own adolescent experiences, Sadaf Foroughi's Ava is a gripping debut about a young girl's coming-of-age in a strict, traditional society. 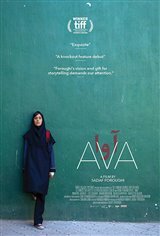 Living with her well-to-do parents in Tehran, Ava is a bright and focused teen whose concerns friendships, music, social status, academic performance resemble that of nearly any teenager. When Ava's mistrustful and overprotective mother questions her relationship with a boy going so far as to visit a gynecologist Ava is overwhelmed by a newfound rage. Formerly a model student, Ava begins to rebel against the strictures imposed by her parents, her school, and the society at large.